We have lived in this house for two years now, and for two years I have been saying that I was going to build this fire pit. However, I kept pushing it to the side because I was too busy. Apparently, all I needed was a couple days of break from school and the crazy idea that, only a couple of weeks after knee surgery, yard work was a good idea. All that said, let me show you what I did! When we moved in, there was this old ugly fire pit that they had burned a shed in so there were nails and all kinds of stuff in it. I thought it was smaller than it actually was when I started digging it all up because it was all grown up around the rocks. 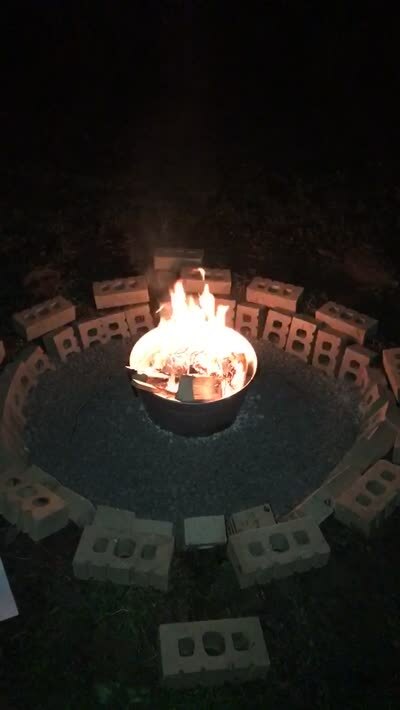 Next I put the bricks inside around the edges to fill up some of the space and keep the fire pit from collapsing with time. Now it’s time for sand! I used a washed play sand. It’s time to add some rocks to make it more aesthetically pleasing. I used pea gravel (which is WAY heavier than it looks). Lastly, I decided to use a galvanized steel bucket for the actual fires because it is easier to clean up and I can bring it in to keep my dogs from getting in the burnt ashes and making a huge mess. I got this bucket at Walmart for $8 and it worked great! For convenience and keeping it out of the elements, I put a tarp over top of the pit and weighed it down with some of the before mentioned huge rocks. Thanks for stopping by! Enjoy this video of my fire pit in use below!